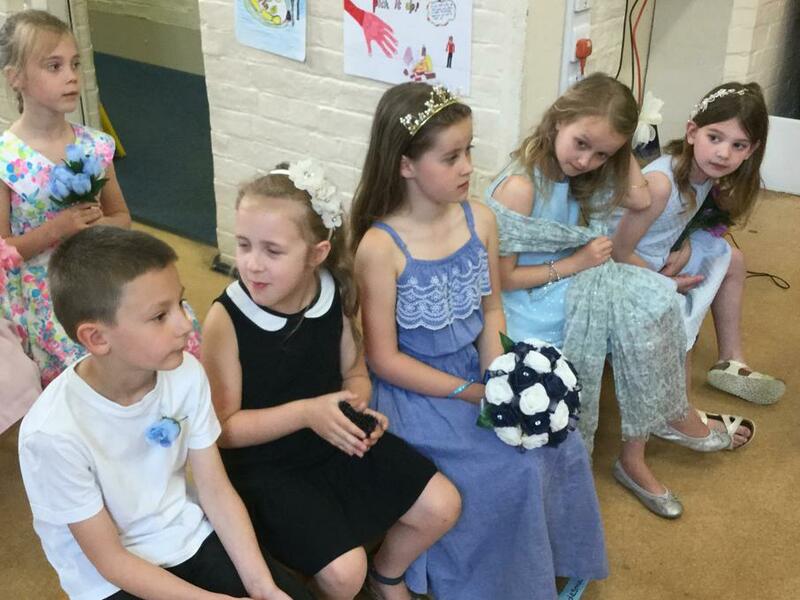 In Birch Class we have Year 1 and Year 2. 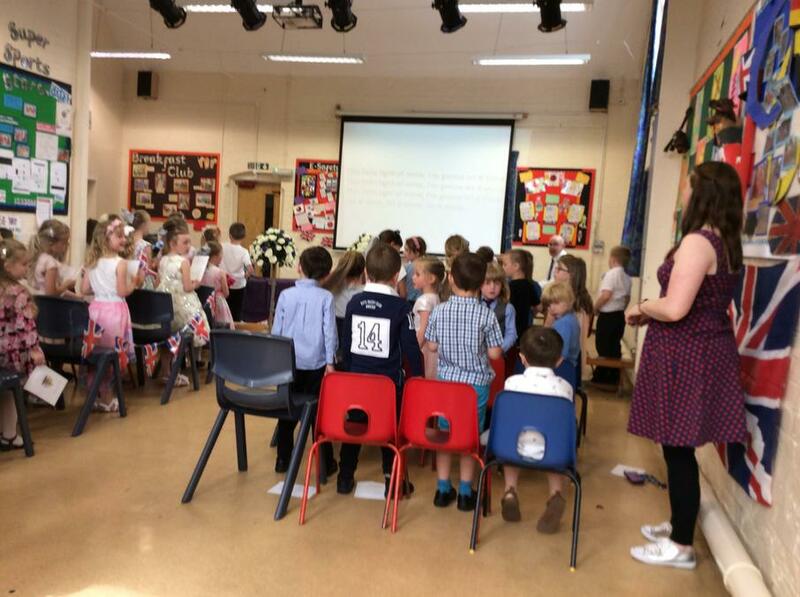 We all learn together and make lots of memories. 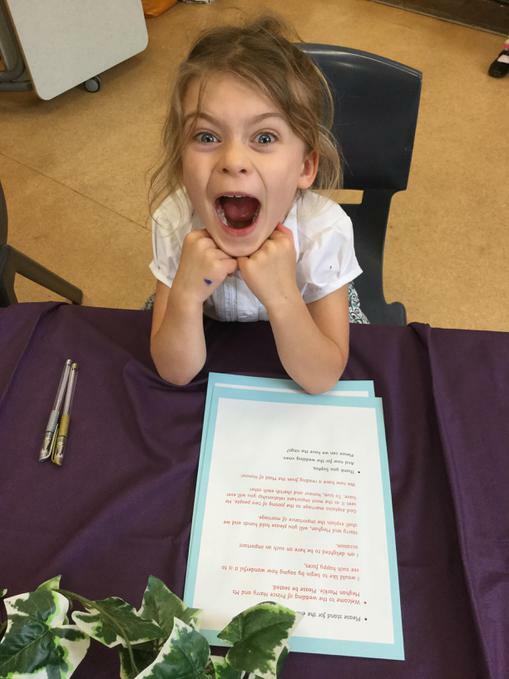 During Spring 2 and part of Summer 1, we will be doing a topic all about animals! 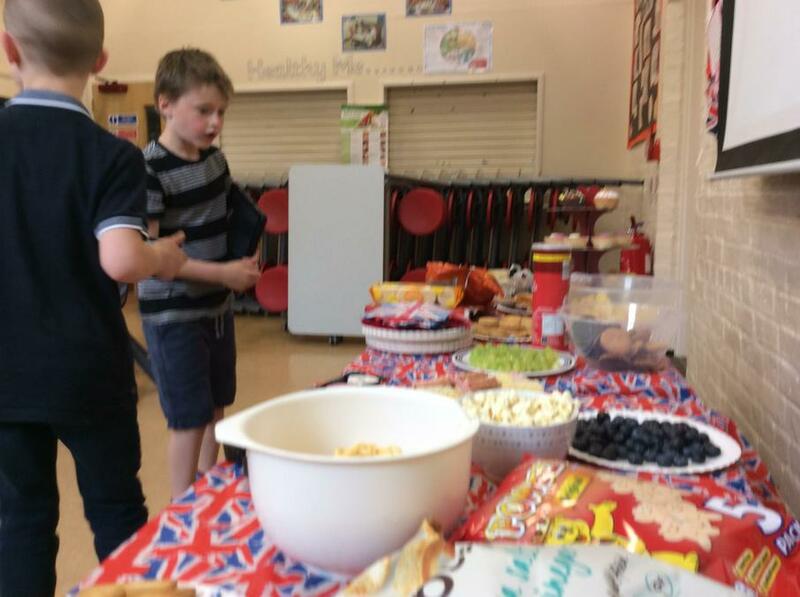 Starting with those animals that live near to us (including pets) and carrying on to look at animals that live all over the world. 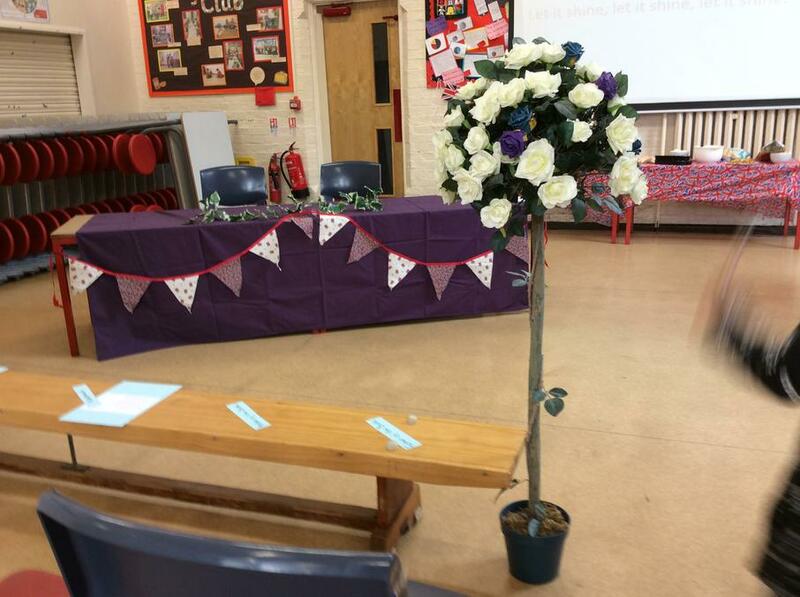 It'll be a 'wild' topic! 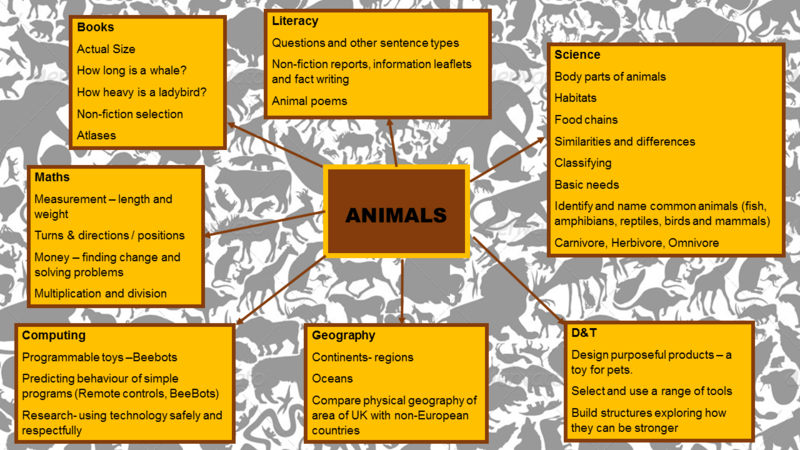 Do you have some knowledge or an experience that you could share, about animals? 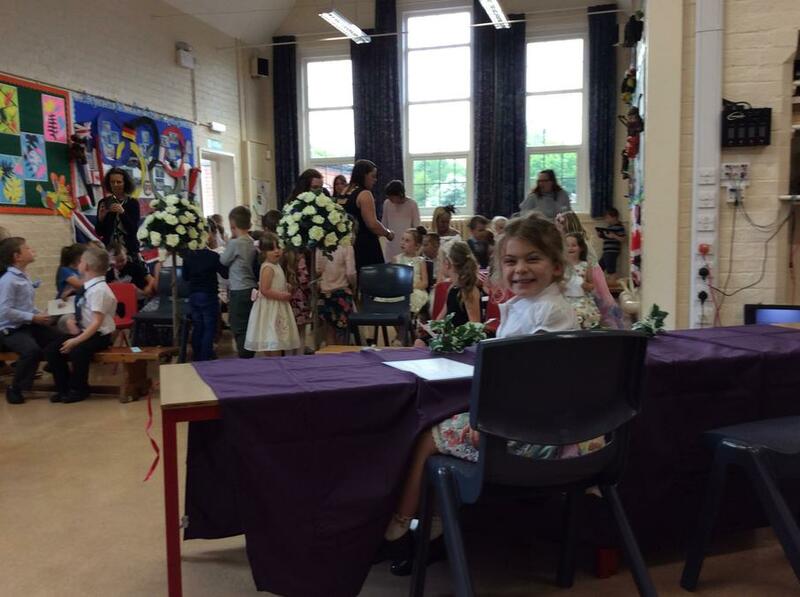 Maybe you own a pet that you could bring to see us. 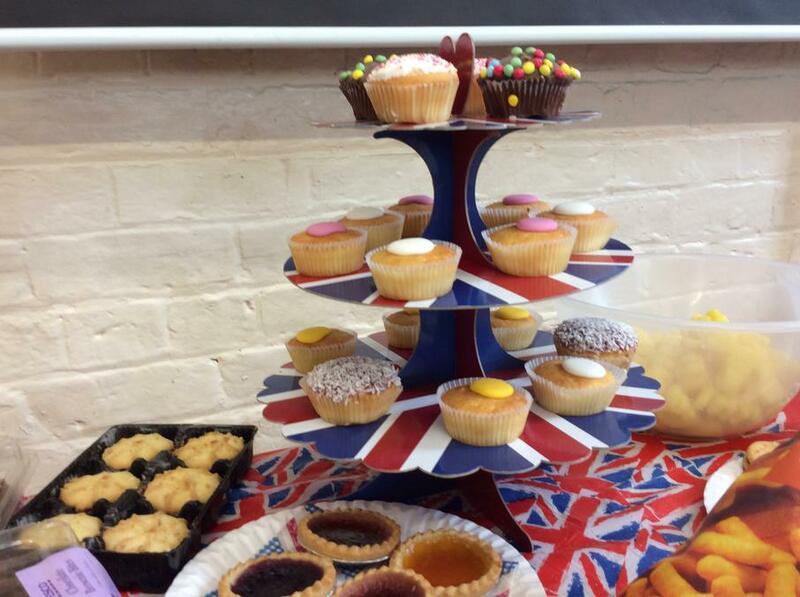 If you do, and you'd like to share it with us, we would love to see you for a visit! 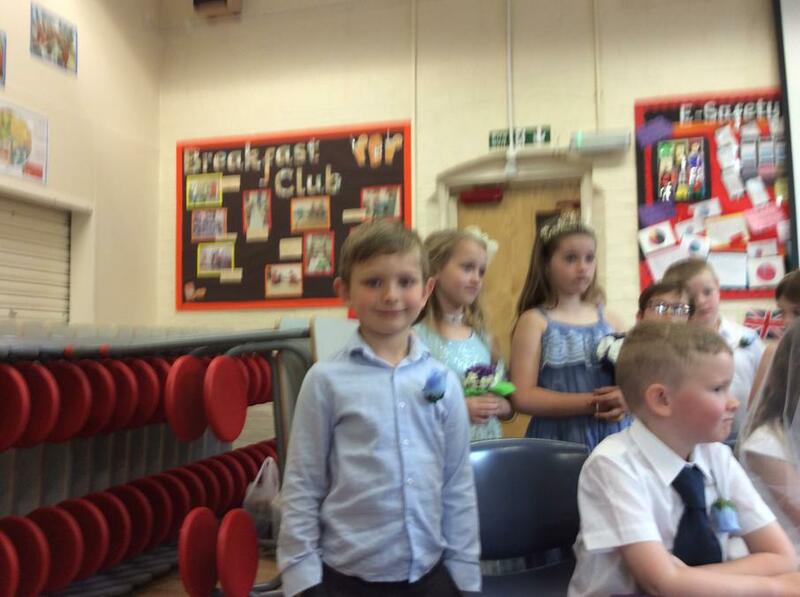 Please see Mrs Parkinson to organise a suitable day and time. 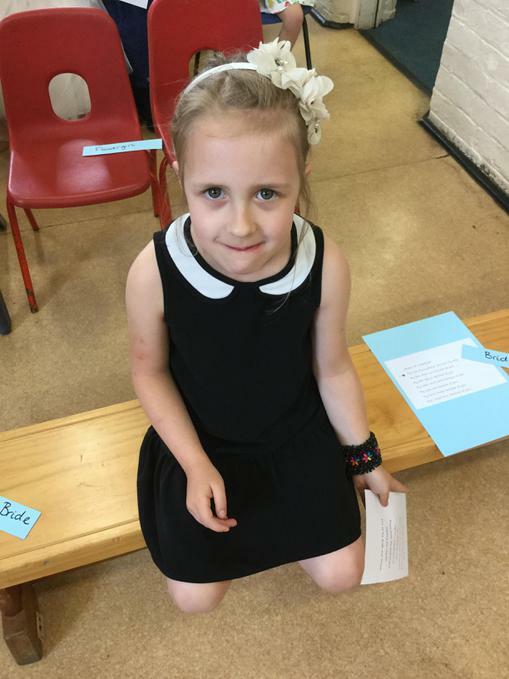 Remember, it's really important to read as often as you can: at least 5 times a week is what we expect and hope to see. 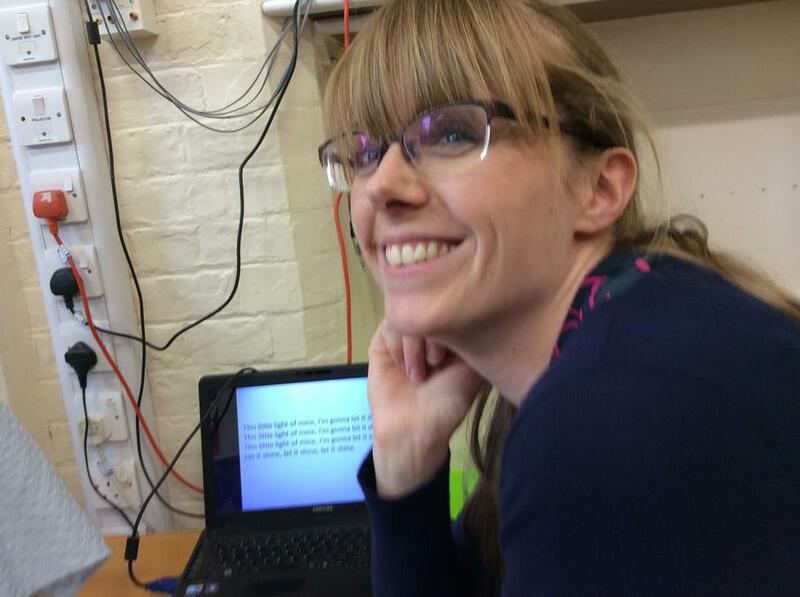 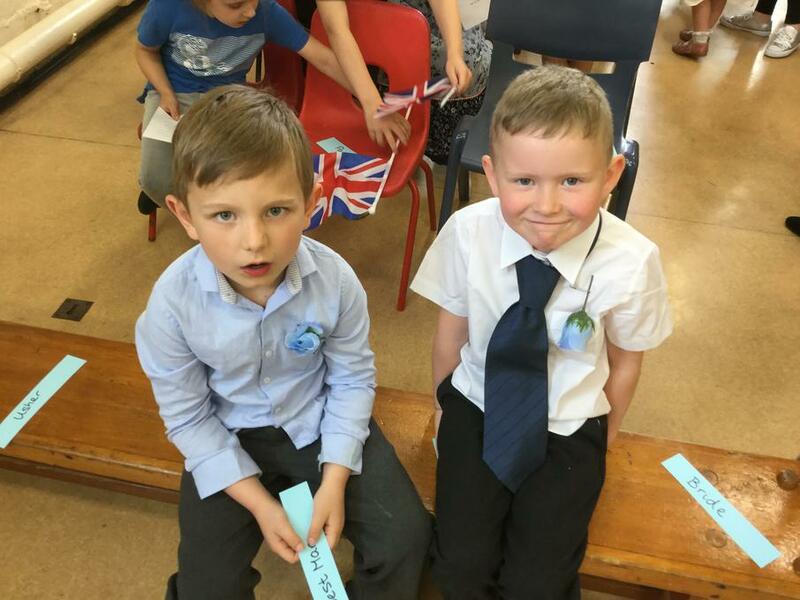 You can also practise your spellings at home, ready to be challenged on a Friday. 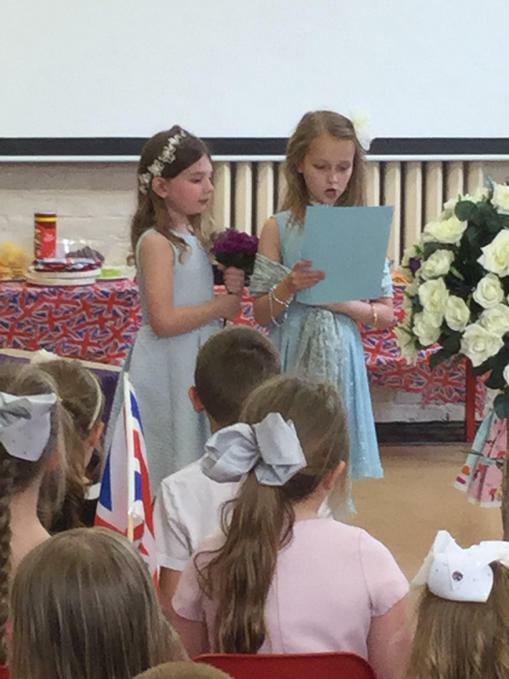 You will receive some topic homework too. 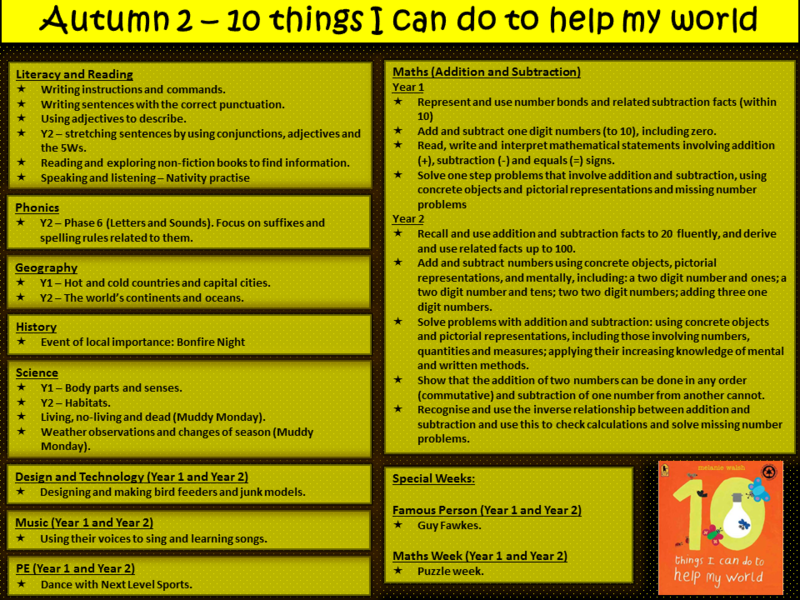 This can be completed and brought in at any time during the topic and there is no limit to how much you can do...be creative! 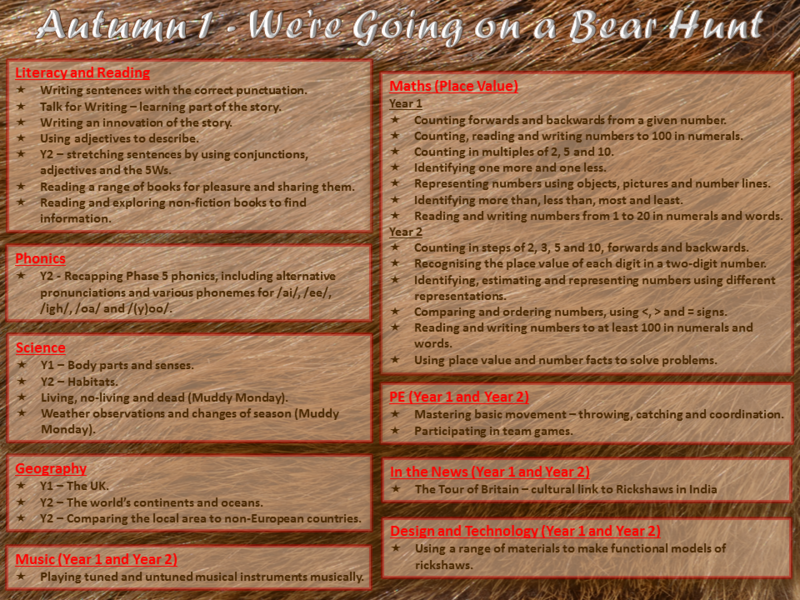 Finally, you can use the topic web and the questions we have written (links below) to find out what we're up to and what we want to know. 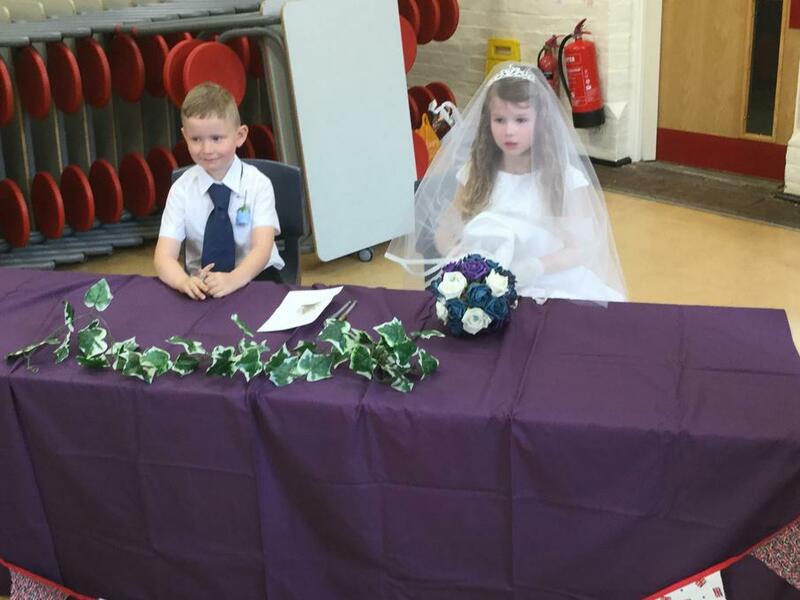 They may give you some ideas. 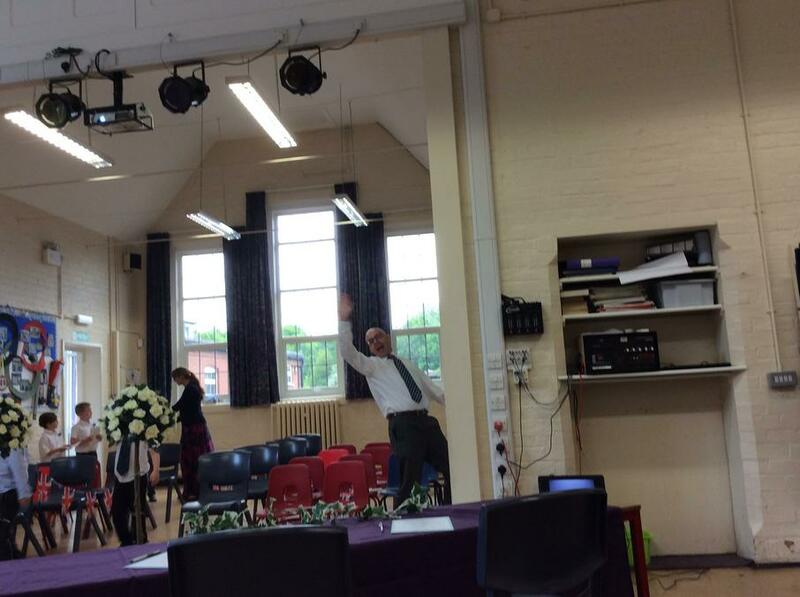 P.E will continue to be on a Friday morning. 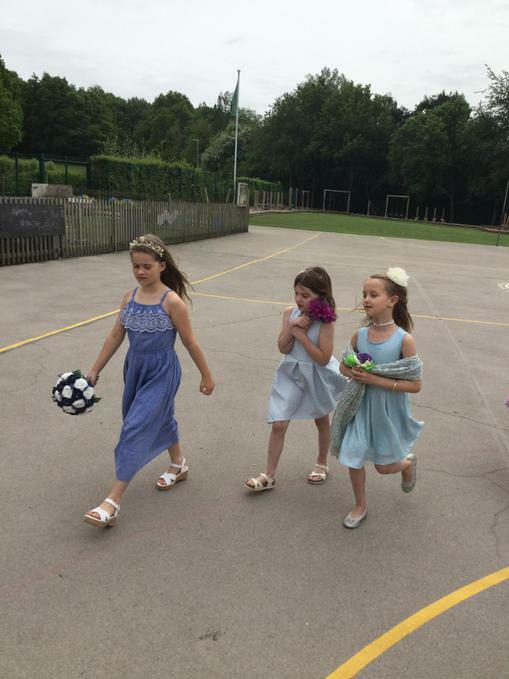 Children are asked to bring an outdoor kit, as they will be doing multi-skills and it may include some outdoor and some indoor activities. 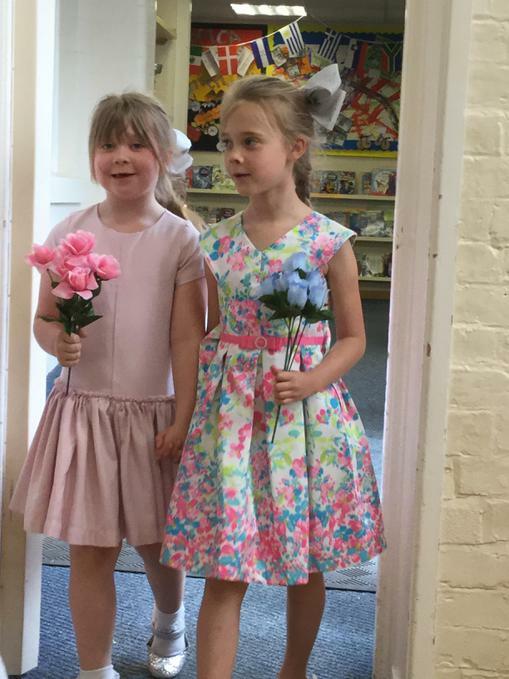 We will continue to have time in the woods on a Monday afternoon (Muddy Monday), so please send children with wellies and warm clothing, plus additional clothing if you wish. 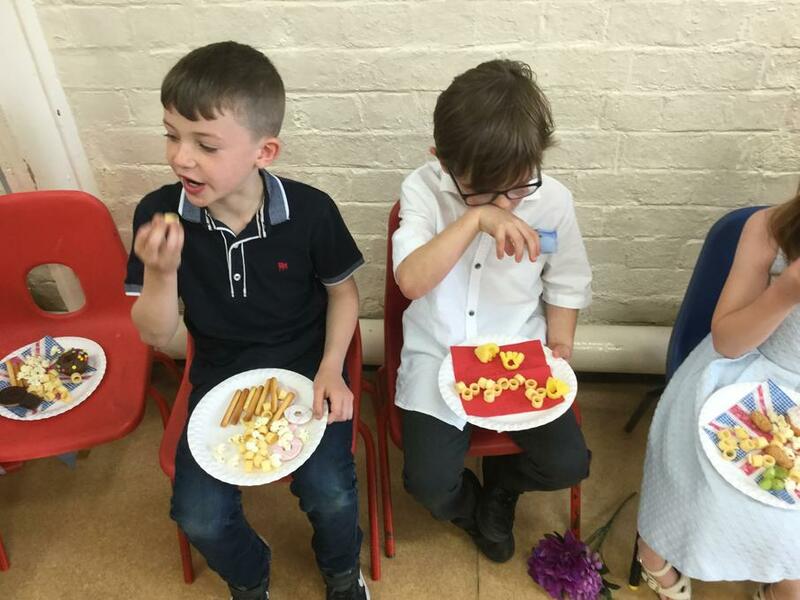 Our annual Easter Egg Raffle will be drawn on Thursday 29th March, so get your tickets from Monday 12th March, to be in with a chance of winning a tasty treat. 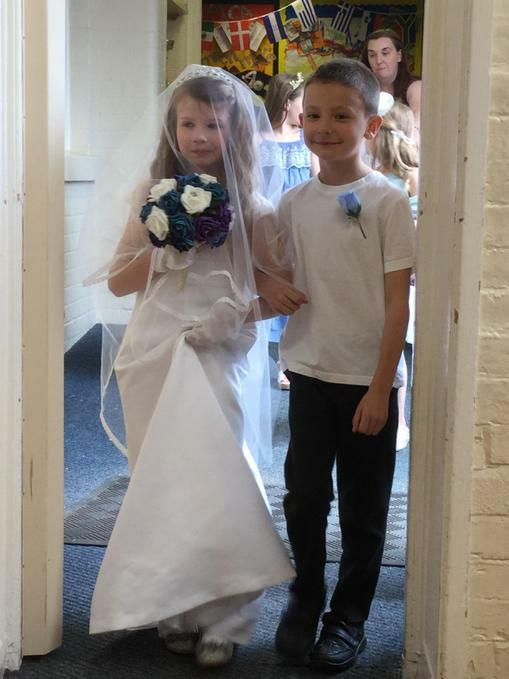 To celebrate the wedding of Prince Harry and Meghan Markle we have had one of our very own. 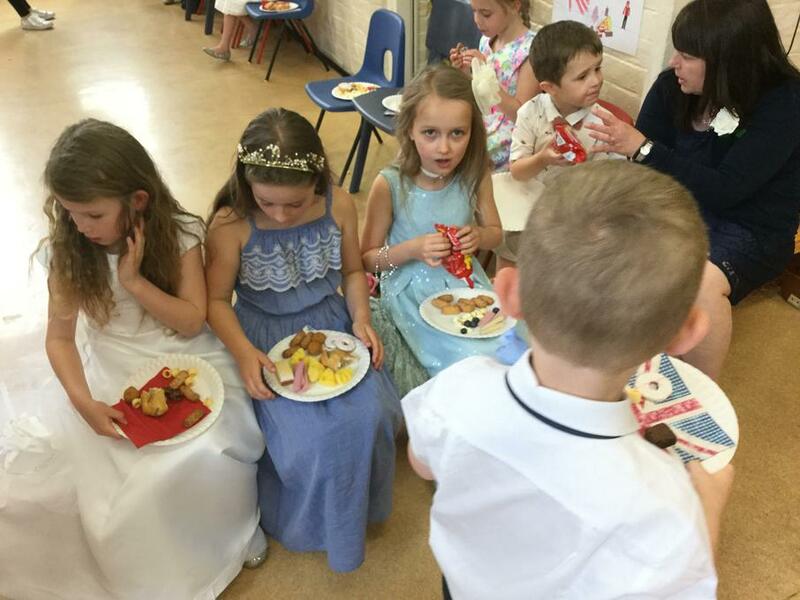 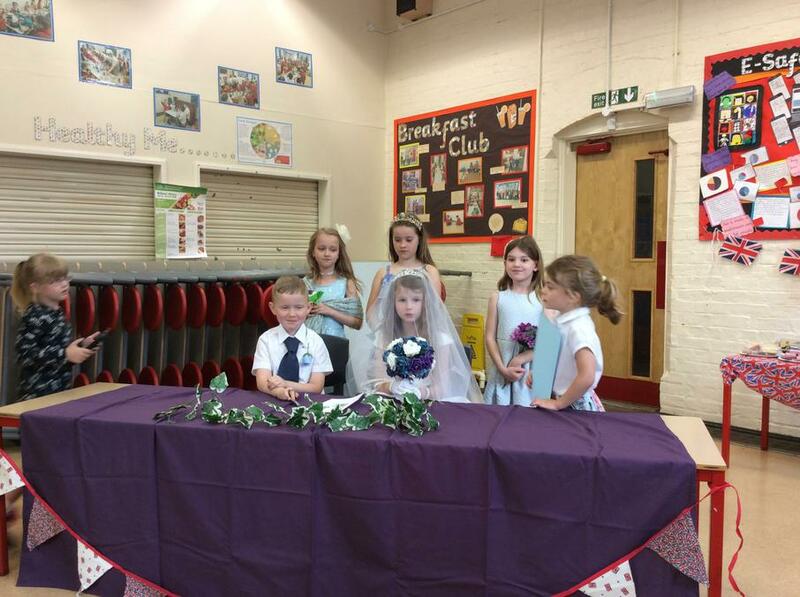 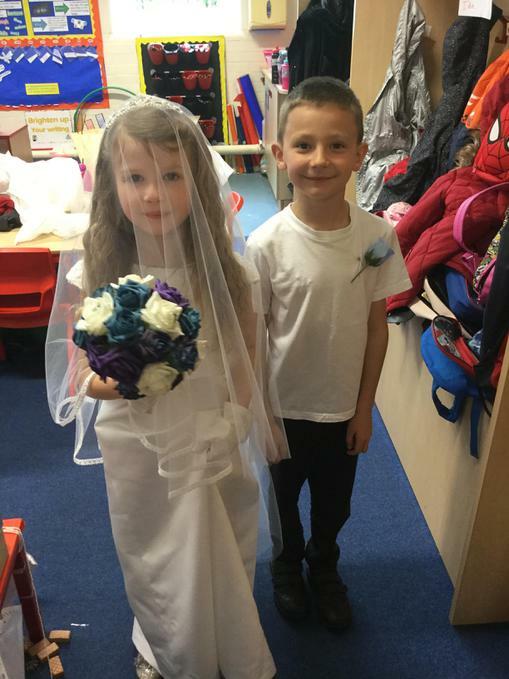 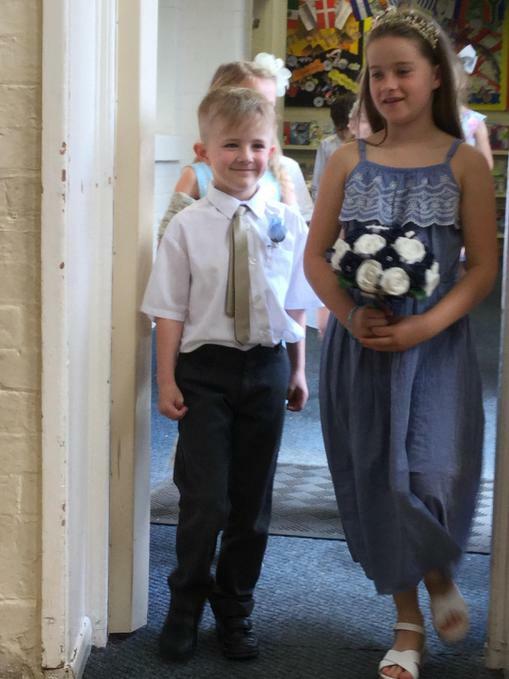 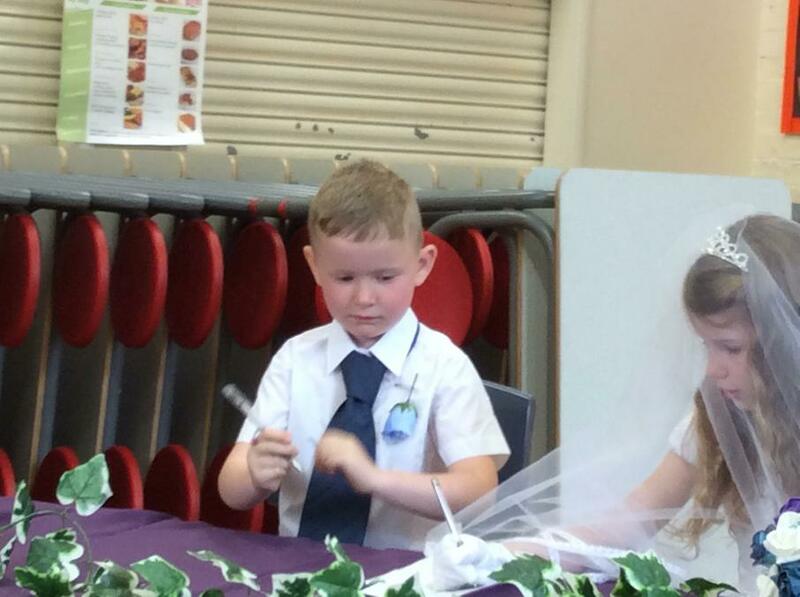 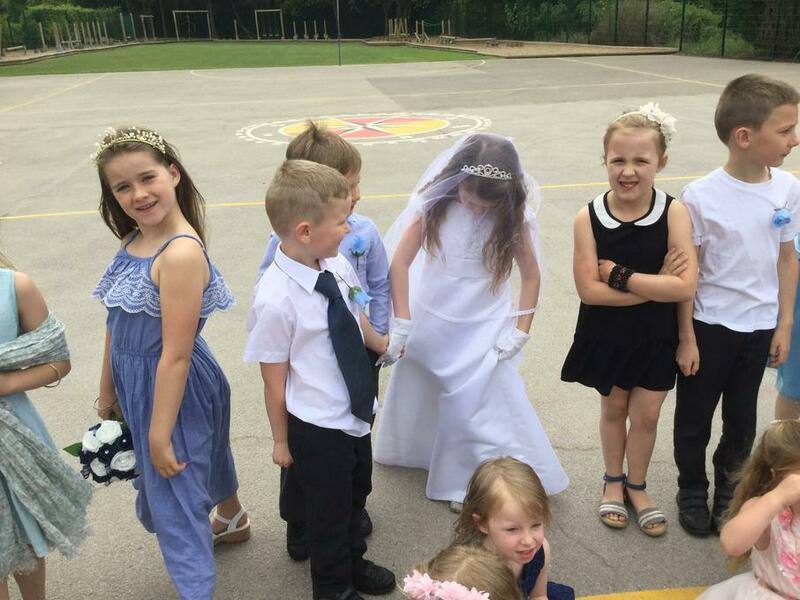 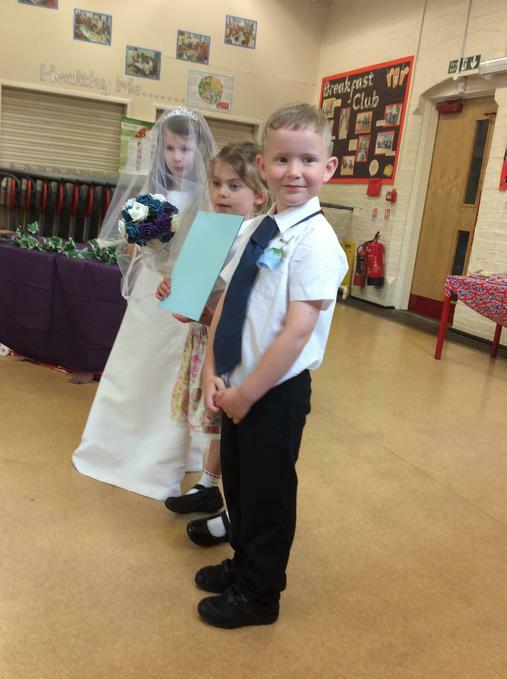 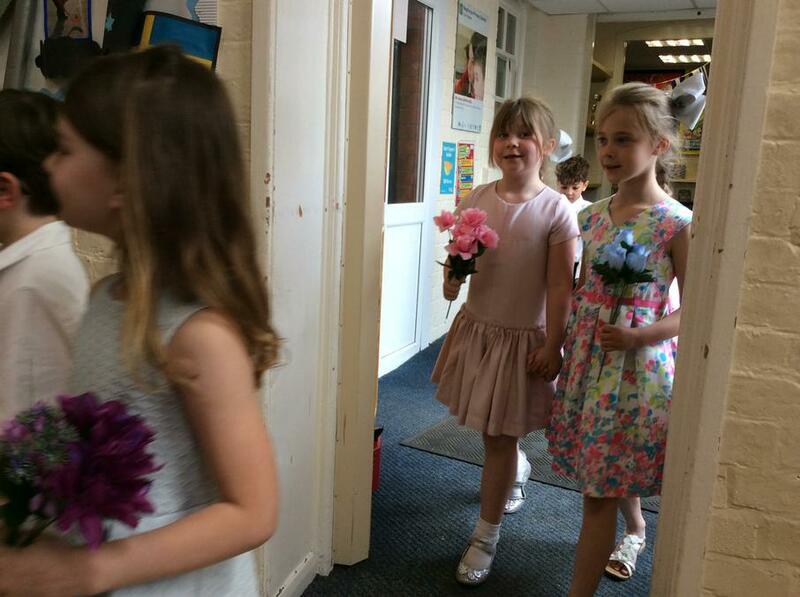 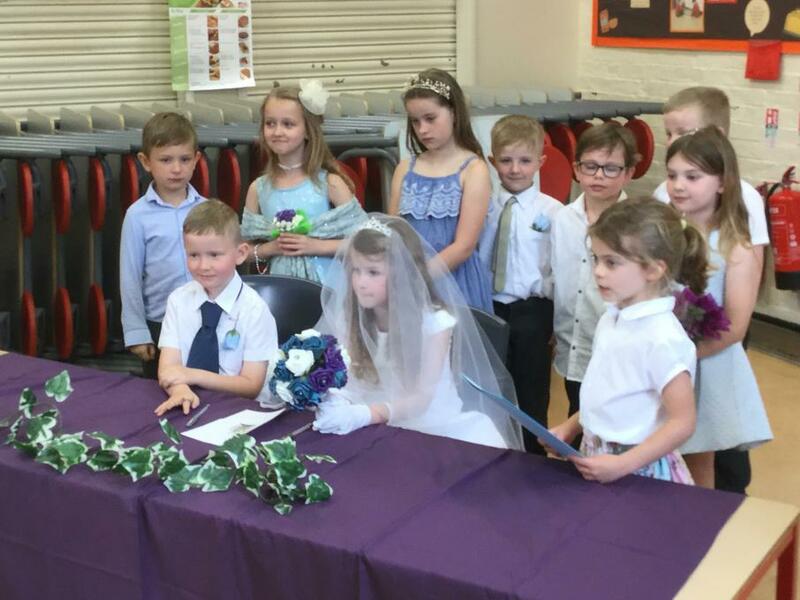 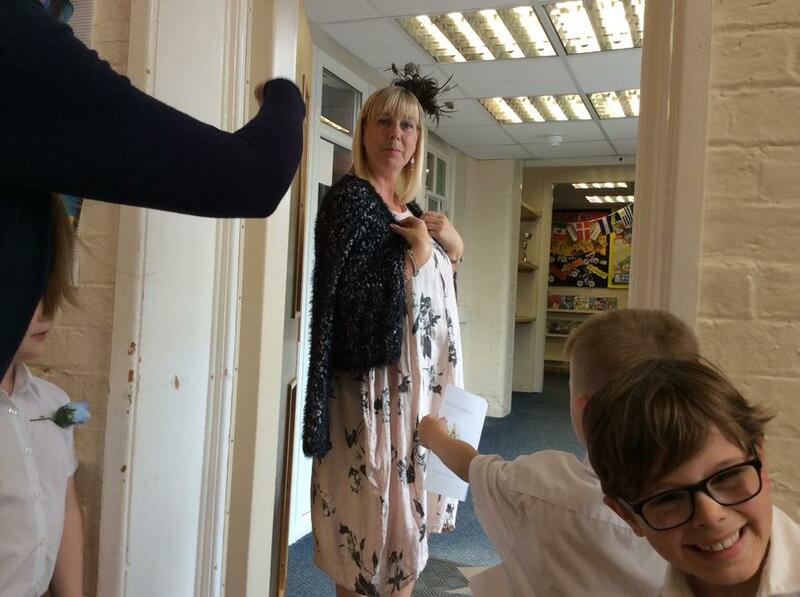 Every member of Oak and Birch class got to choose a role they would like to play at the wedding from photographer, to page-boy, flower girl to father of the bride - we had it all! 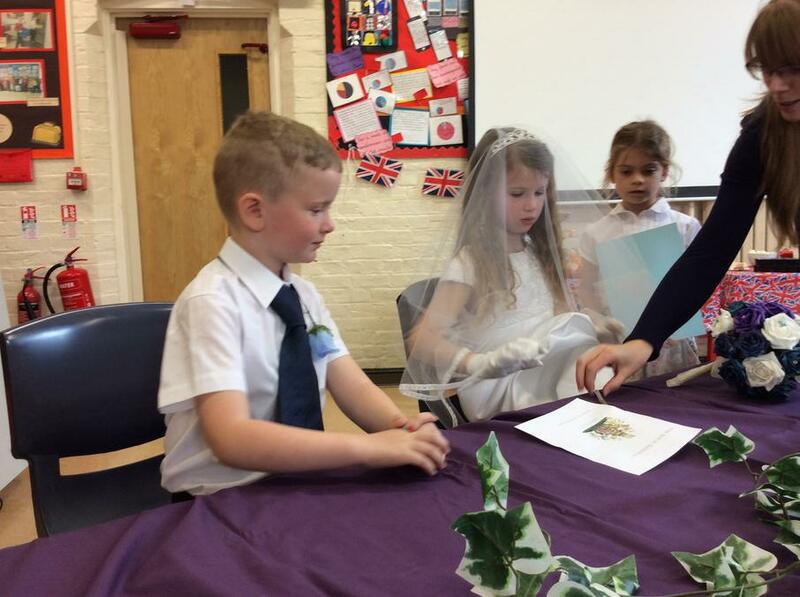 Then year 1 and 2 made and wrote invitations for Foundation children to come as guests; and on the afternoon of Wednesday 16th it all started getting very exciting. 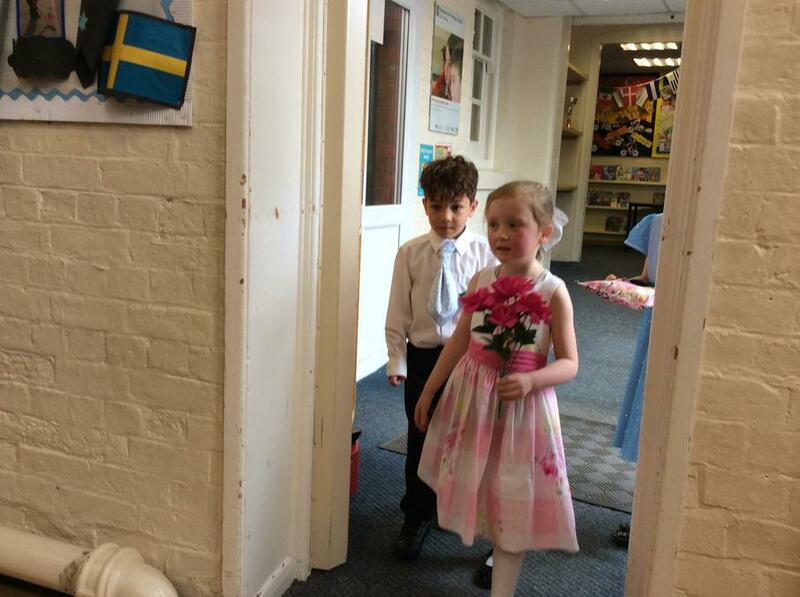 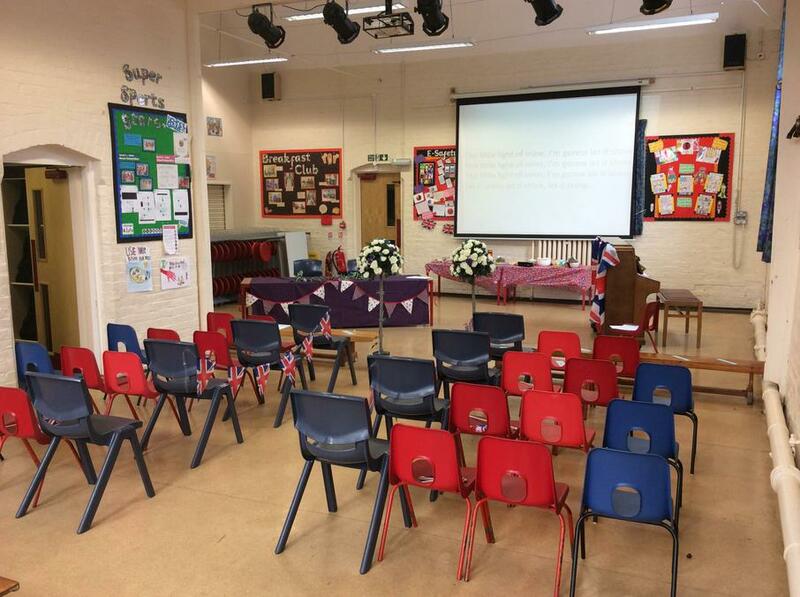 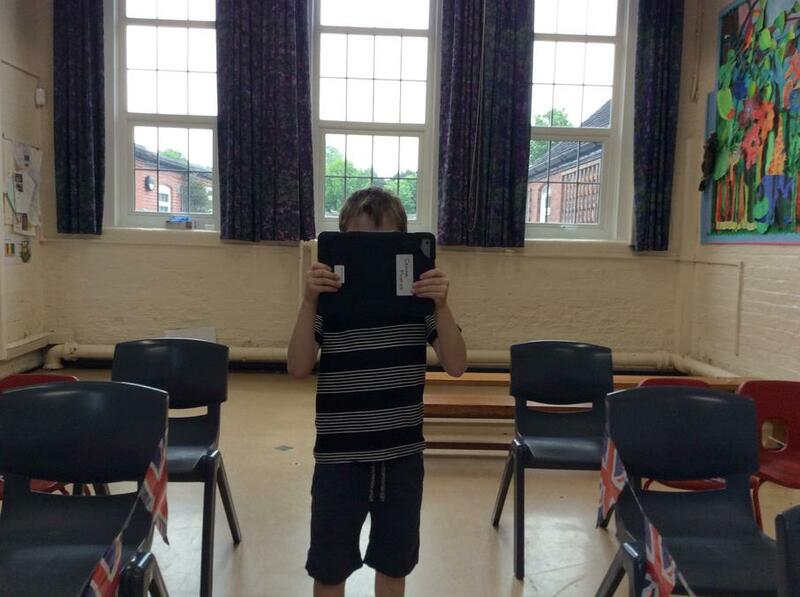 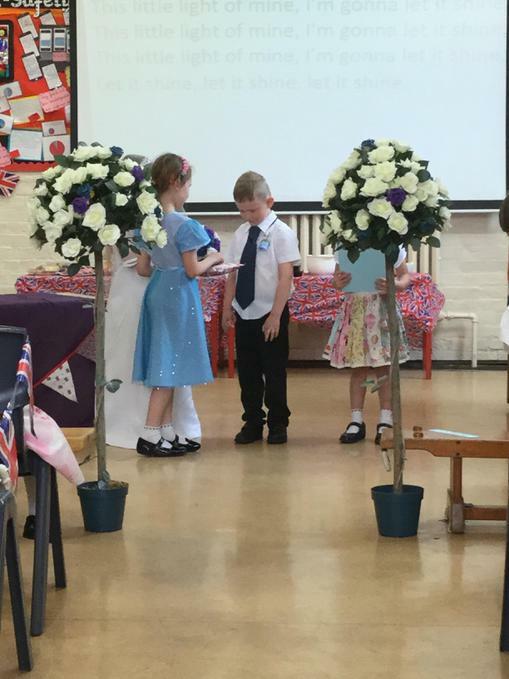 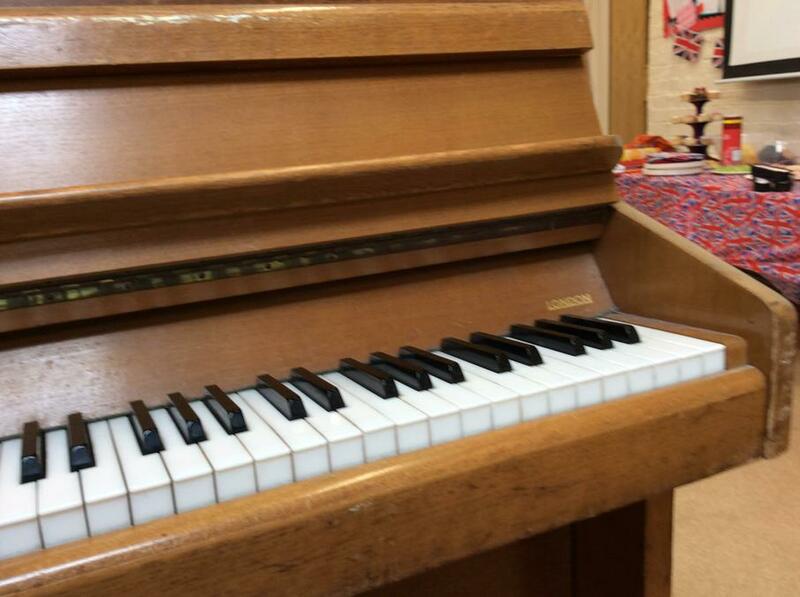 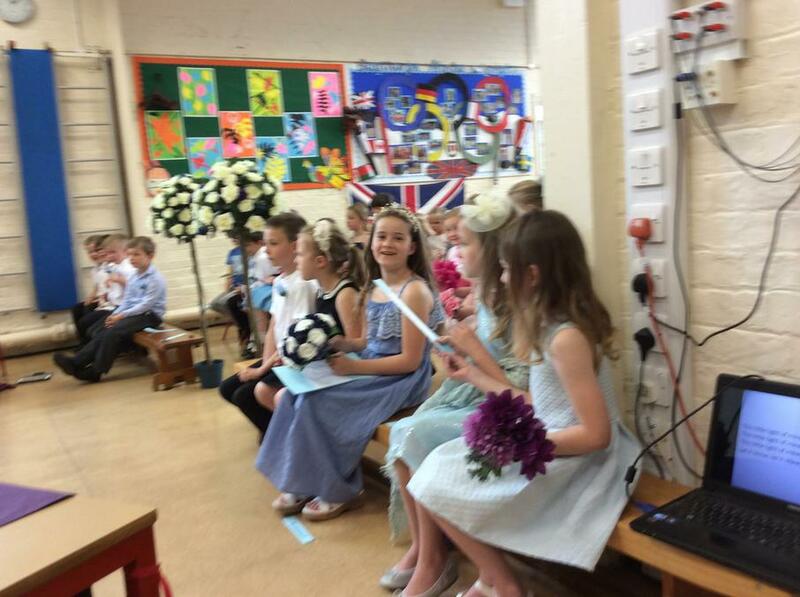 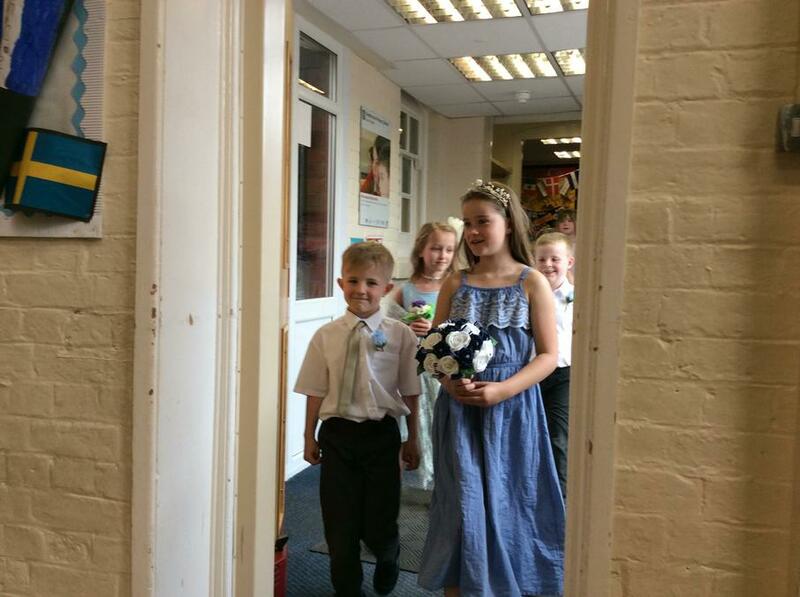 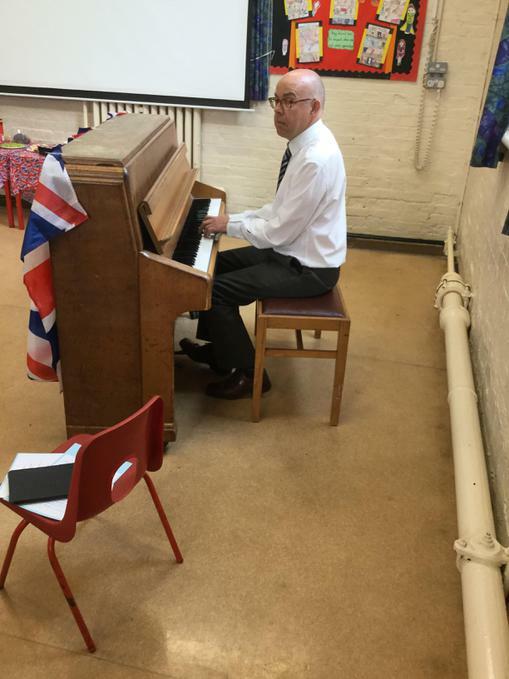 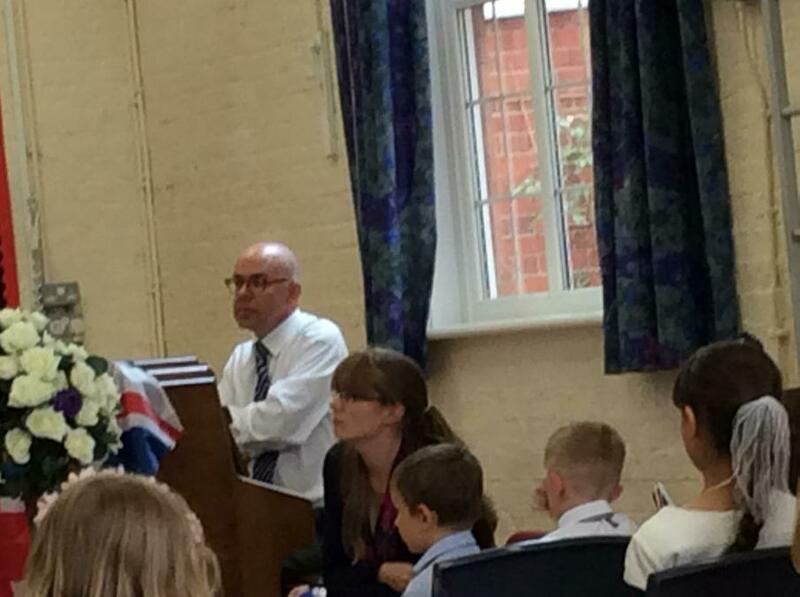 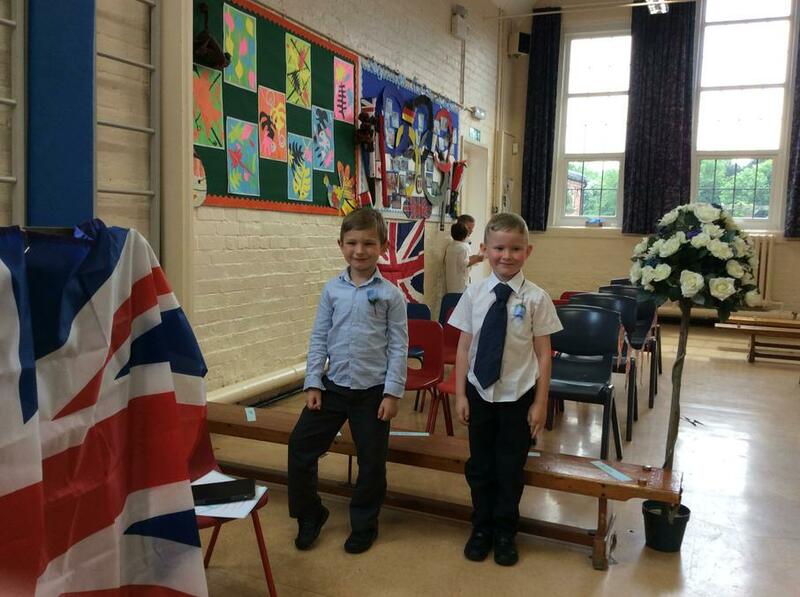 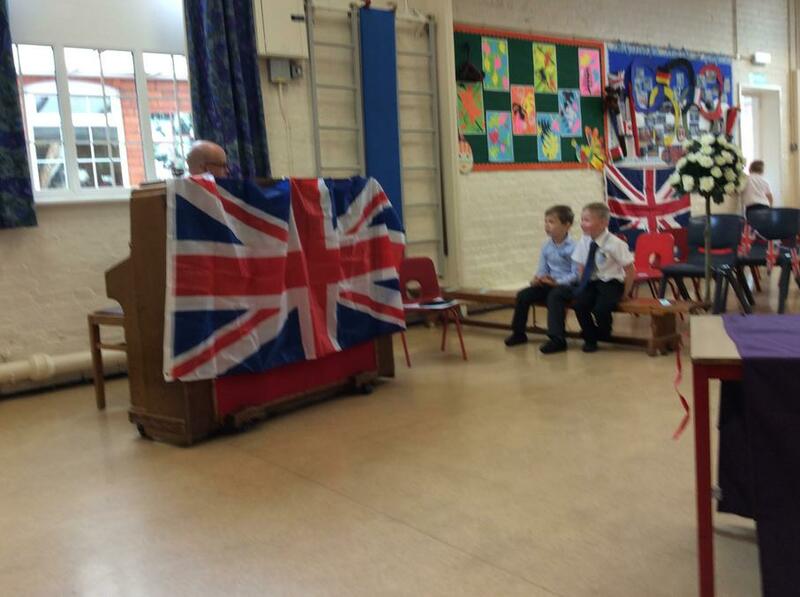 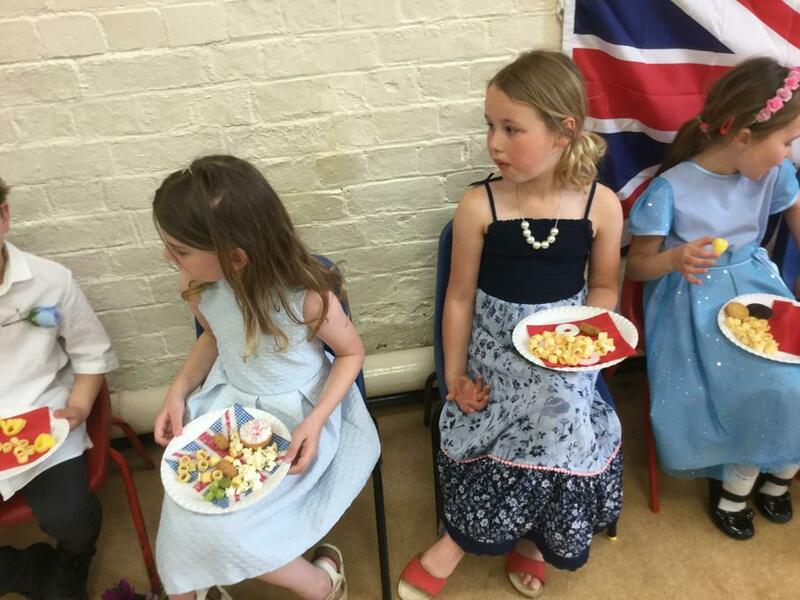 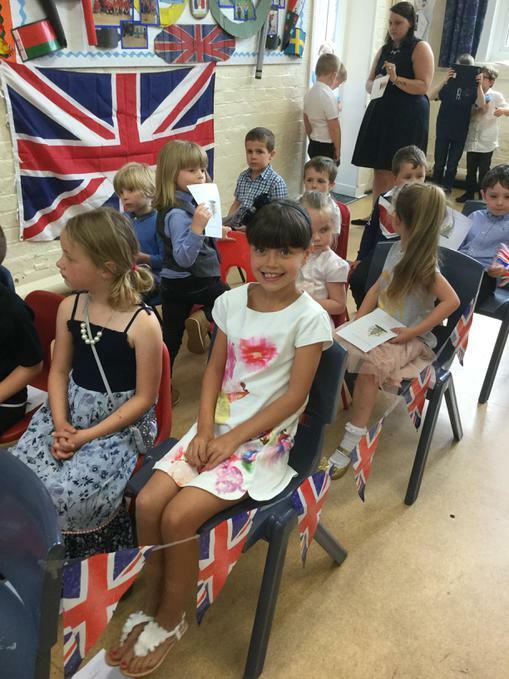 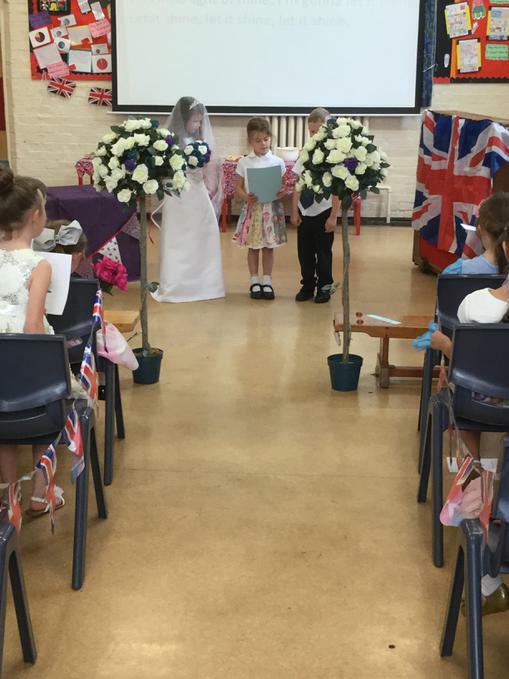 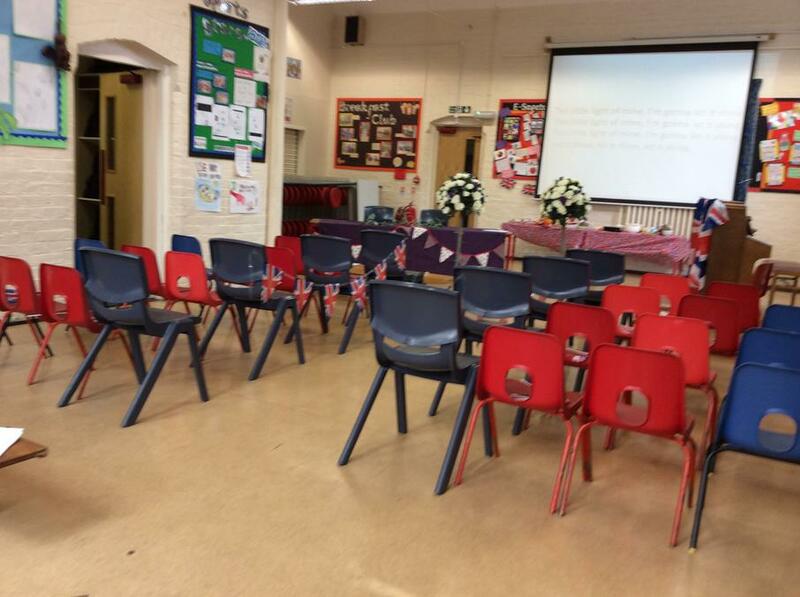 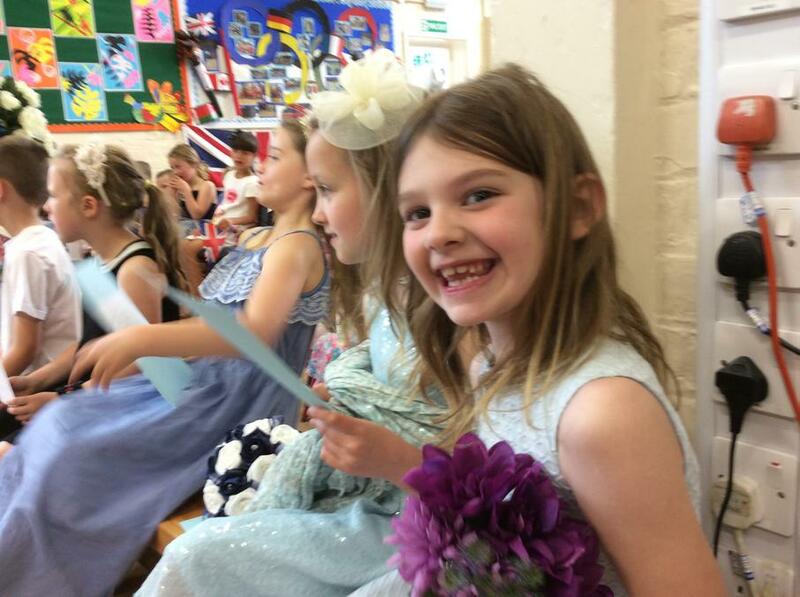 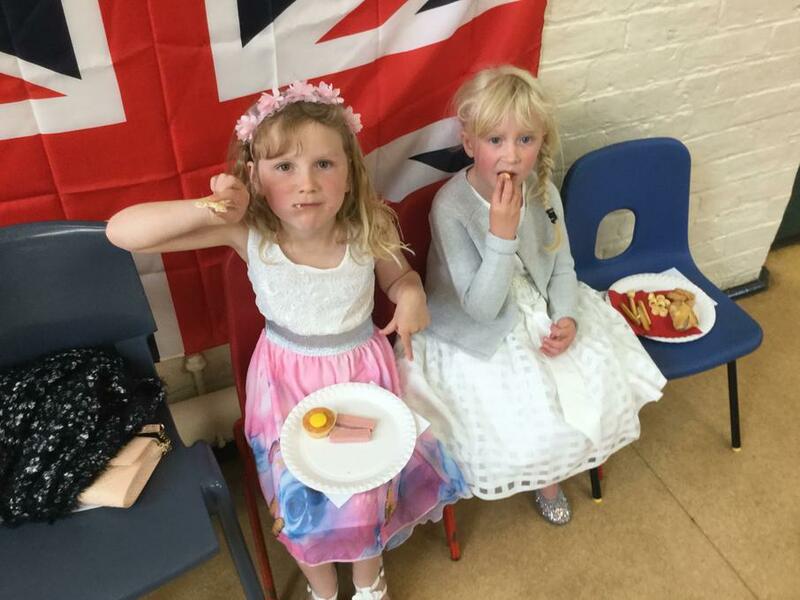 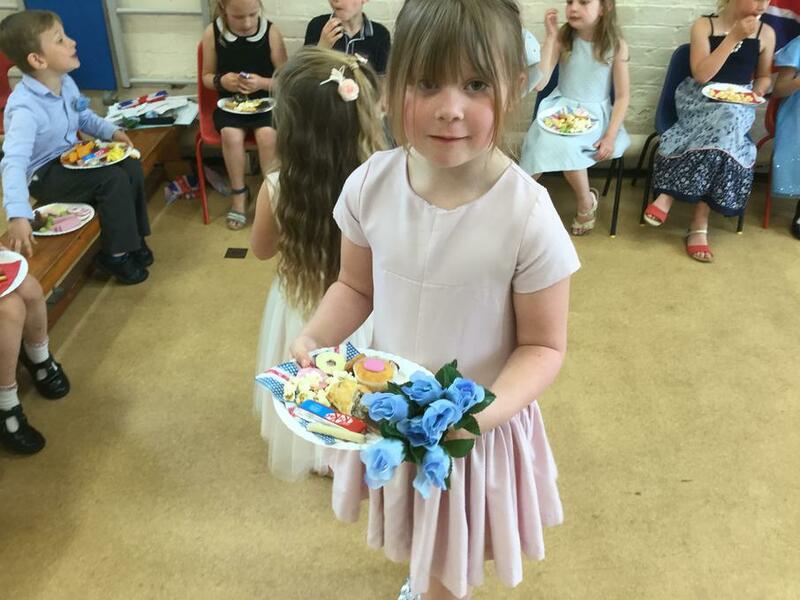 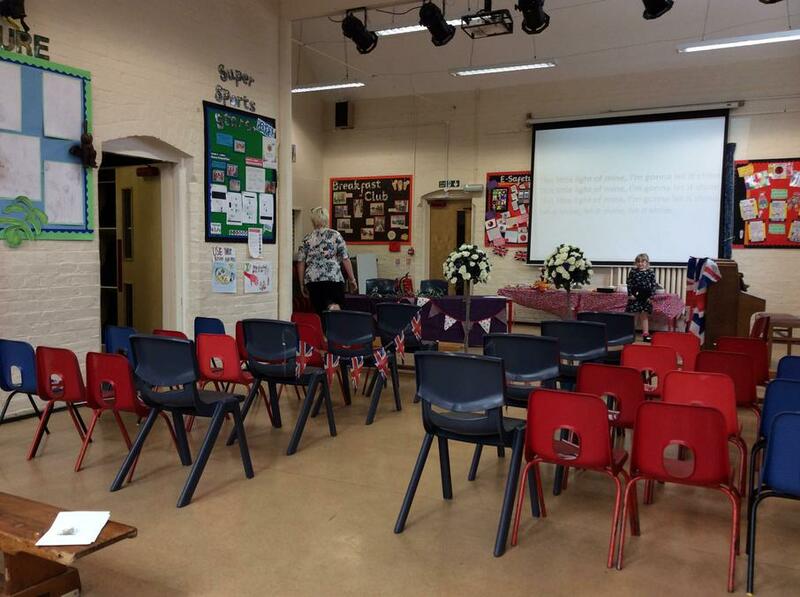 We had Mr Walton playing the wedding march on the piano as Meghan and her father walked down the aisle of the school hall elaborately decorated with Union Jacks, bunting and rose trees. 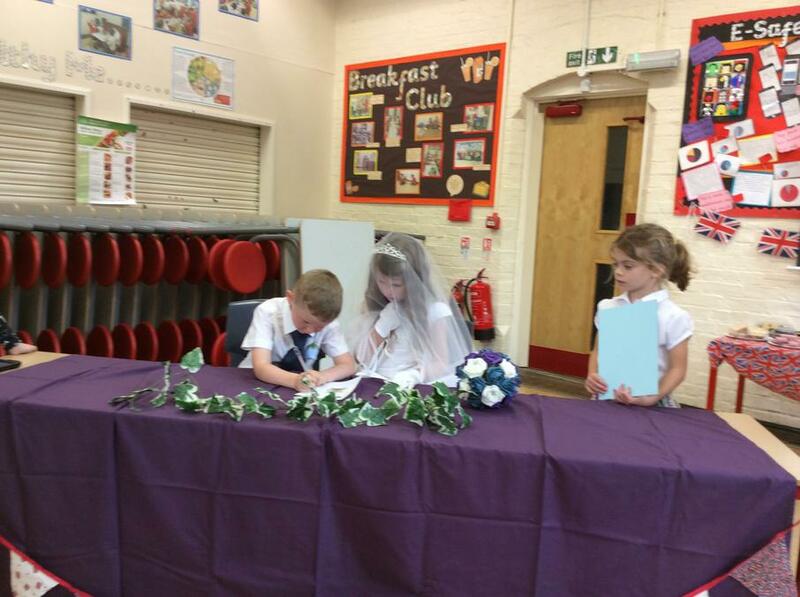 The ceremony, signing of the register and then of course a fabulous Wedding Breakfast and dancing to top it all off. 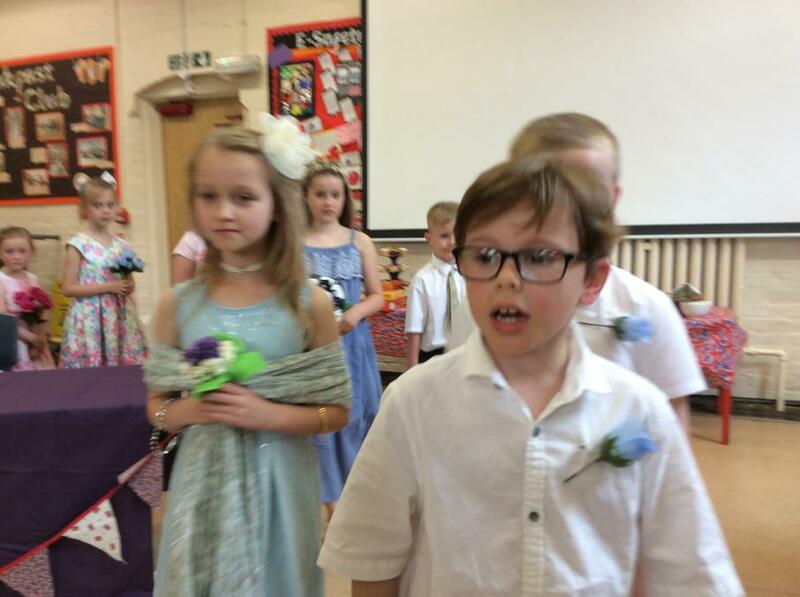 Take a look at a selection of our photos taken by photographers Gracie-Mai, Noah and Fynn and some from Mrs Harrod and Mrs Jenner-Dyer too. 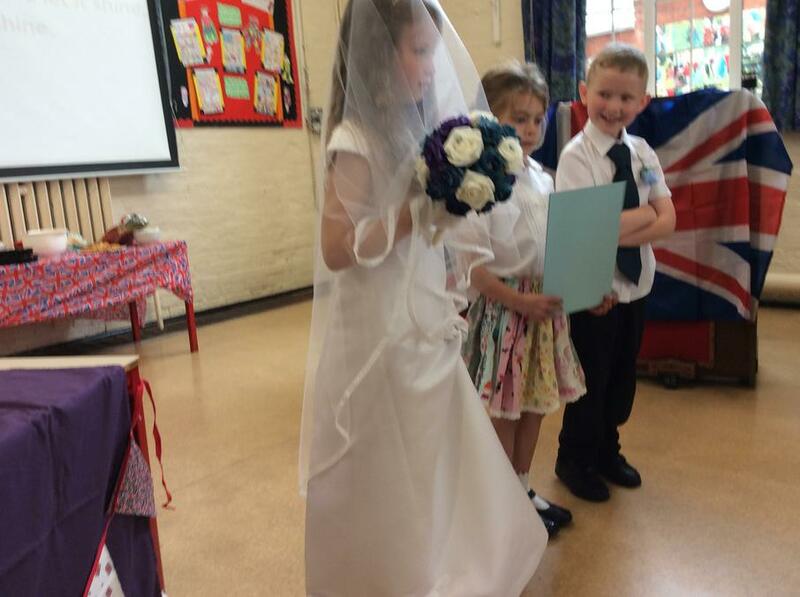 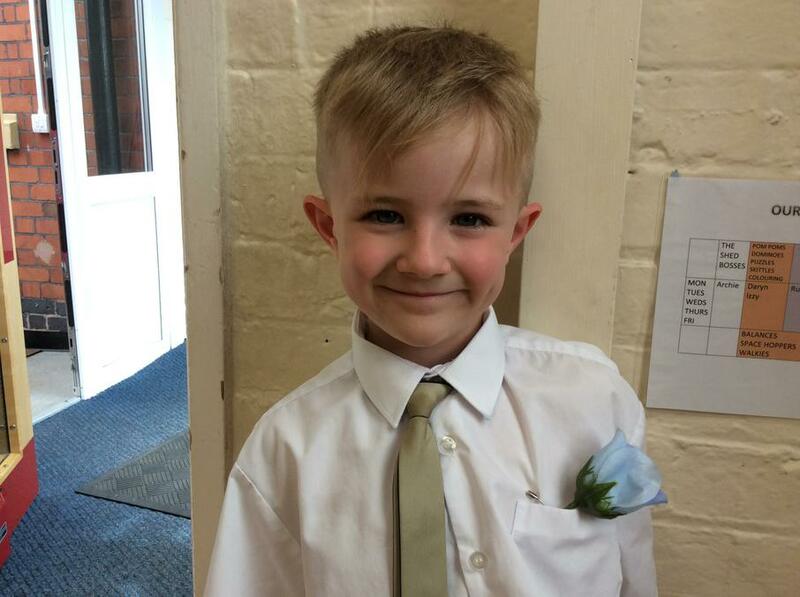 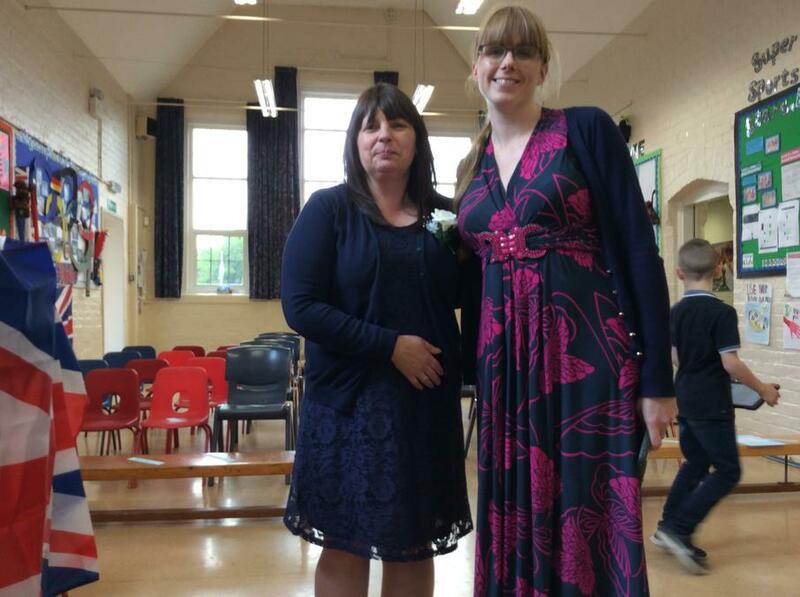 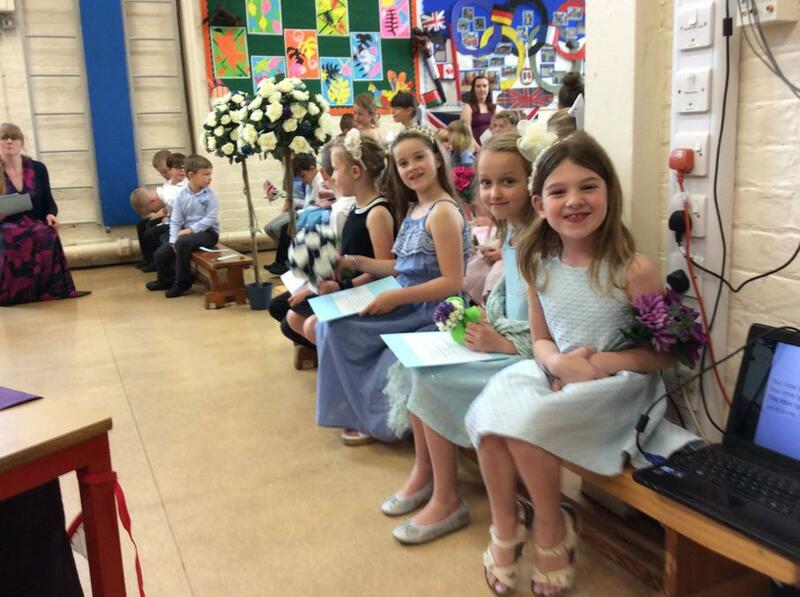 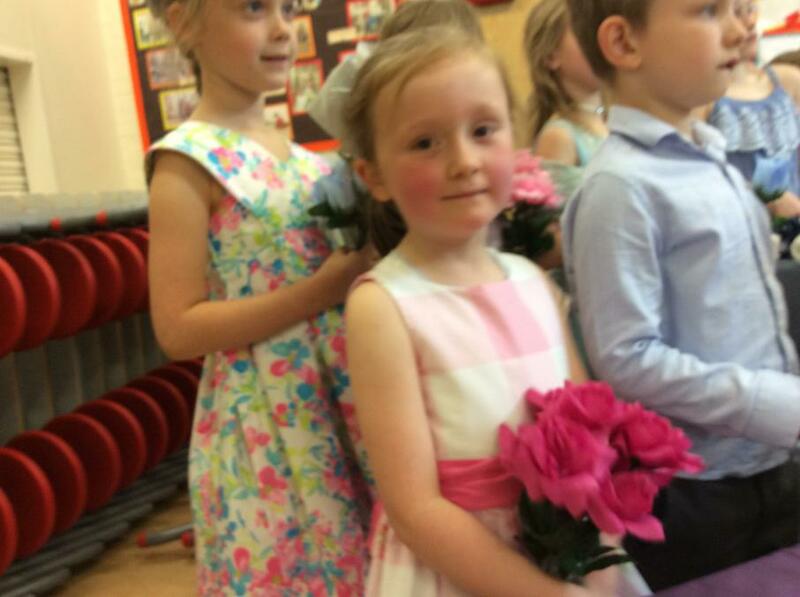 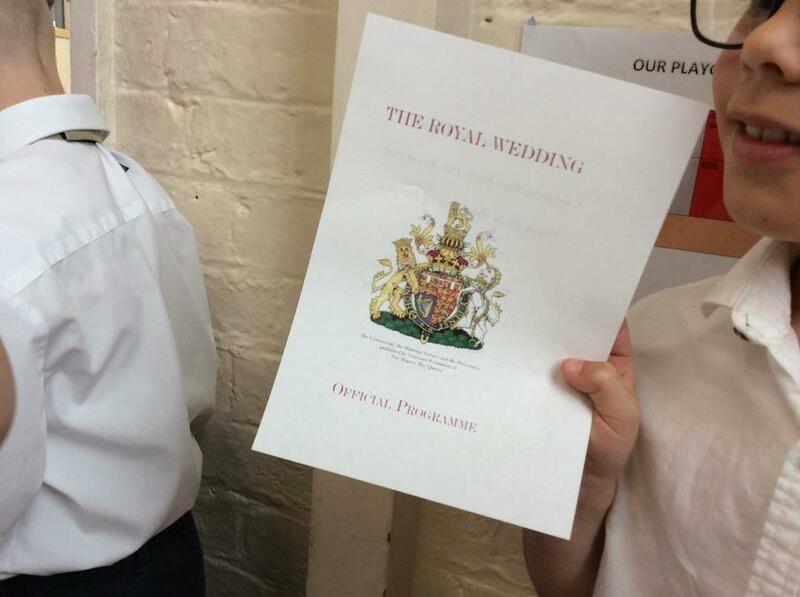 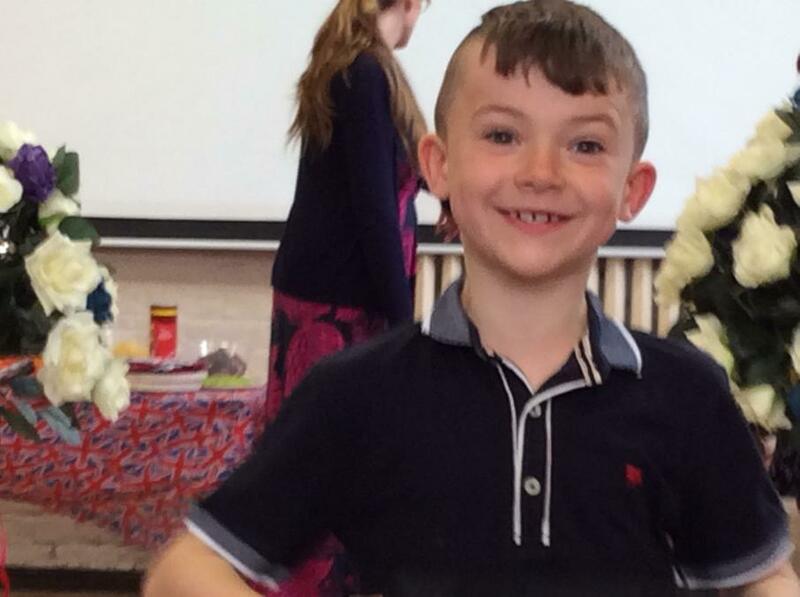 And don't forget to look at Oak's class page too for even more images of the big day!